Have you ever wanted to take a road trip of a lifetime? Then this is your chance to speak with the Experts! 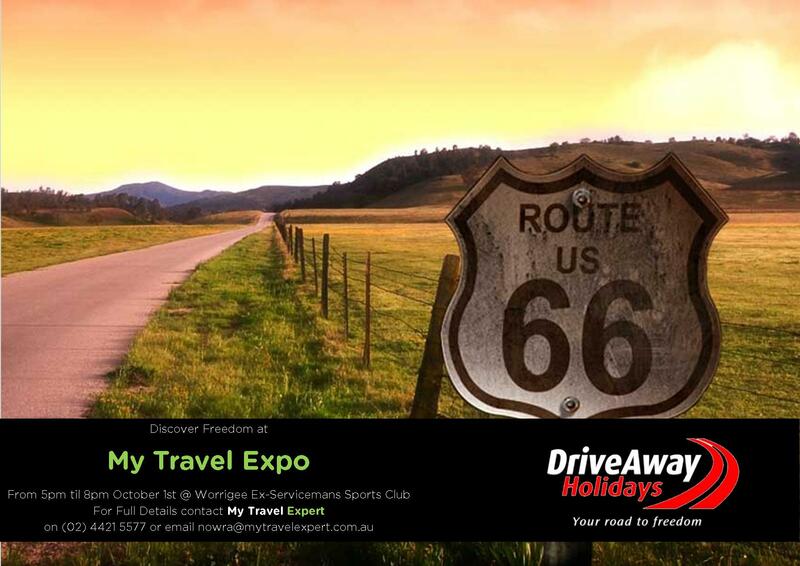 On the 1st October from 5pm to 8pm at Worrigee Ex-Servicemans Sports Club we are hosting the South Coasts largest Travel Expo – My Travel Expo, we have several companies attending who specialise in car hire and leasing including Driveaway Holidays, Qantas Holidays and More. Drive Away Holidays is a car rental and leasing specialist, and can help you pick out the right vehicle for whatever your holiday requirements. Want to drive the Tuscan Hills? Perhaps take a motorhome holiday of Tasmania, or maybe just maybe take yourself along Route 66 in an old style Muscle Car. If you want to drive your next holiday, then this is your chance to speak with the Vehicle Hire Experts!